Charming and spacious apartment just renovated and furnished, located just steps from the historic district of Rome Papalina : Prati . The facility is equipped with all the comforts for a pleasant holiday in Rome . It is also located in one of the most central districts of Rome, few minutes walk from the Vatican and Castel Sant'Angelo and connected by Metro to all the attractions of the Capital. 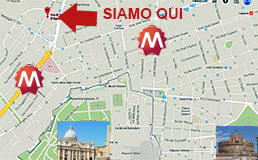 We are in Via San Tommaso d' Aquino , 32 Rome . The Prati area , where the structure is located , is conveniently served by public transport such as buses, metro ( Cipro - Musei Vaticani- Ottaviano Line A ) and taxis . From Leonardo Da Vinci Airport : FL1 until the Staz . Terms then Metro A ( get off at "Cipro" ) . From Ciampino Airport : Bus line 720 ( 20 stops ) to the stat. Metro B Laurentina until the stat. Terms then line A to the stat. "Cipro" . Alternatively, at the airports you can use the service TAXI public or shuttle bus .